One of a kind corporate retreat or full time living Beautiful Well Maintained Mini Estate! A Custom built home by one of the top builders in the area. 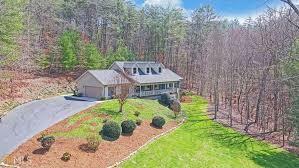 Nestled in a grove of mature poplars on large lot with creek bordering on one side with area for a pond to create, bridge and gazebo if you choose to build one. The interior has a new hardwood floors and custom wood trim throughout. Cathedral ceilings in the living room with open natural wood built in library with the stone gaslog fireplace. The living room is open to the breakfast area off the kitchen, which has lots of natural wood cabinets with plenty of storage. Formal dining room, huge screened porch off breakfast room,Granite counters.